I know that some of you looked at the title of this recipe and thought sourdough chocolate what? Or perhaps you thought it was a typo and that this is actually a sour cream chocolate cake. Actually, it is a sour cream chocolate cake, but the recipe title is also correct. 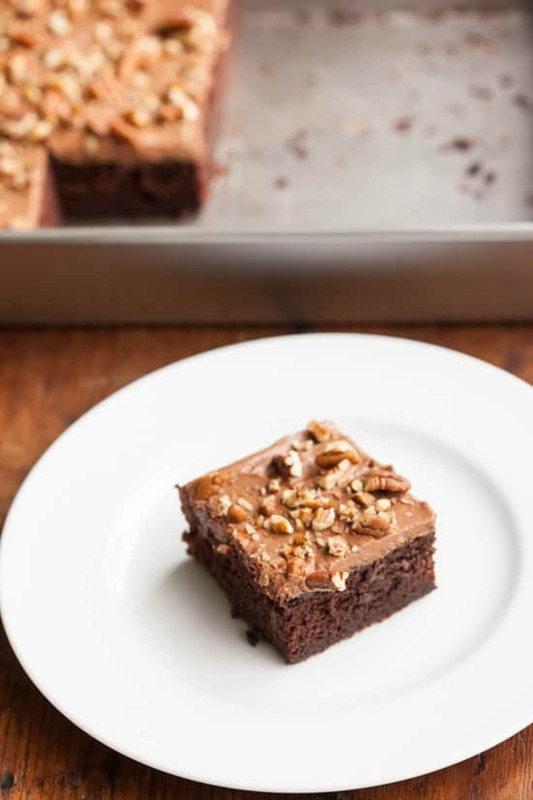 This chocolate cake includes a cup of sourdough starter in the batter, which is awesome for those of us who keep sourdough starters for bread and are sometimes looking for ways to use up the cup of starter that gets discarded when feeding our bubbly little pets. 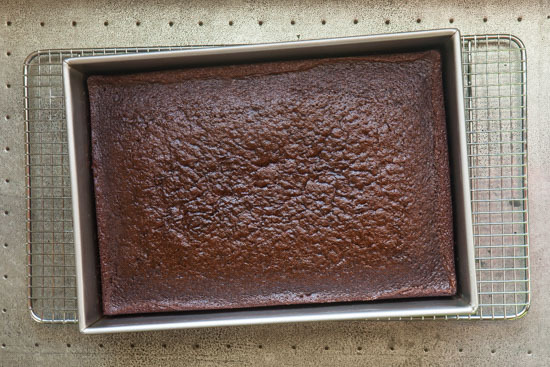 If you don’t have a sourdough starter, don’t worry, this cake can easily be made without one and it will still be an absolutely delicious chocolate sour cream cake. Instructions for doing this are in the recipe notes. If you would like to experiment with sourdough, here are my instructions for creating your own starter. The great thing about this cake, other than the fact that you can use up a cup of sourdough starter discard, is that this cake is super easy to make. It’s a dump everything into one bowl and mix for three minutes kind of cake. It’s also one of the best chocolate cakes I’ve ever tasted– rich, moist, sweet, intense. And the chocolate cream cheese frosting? 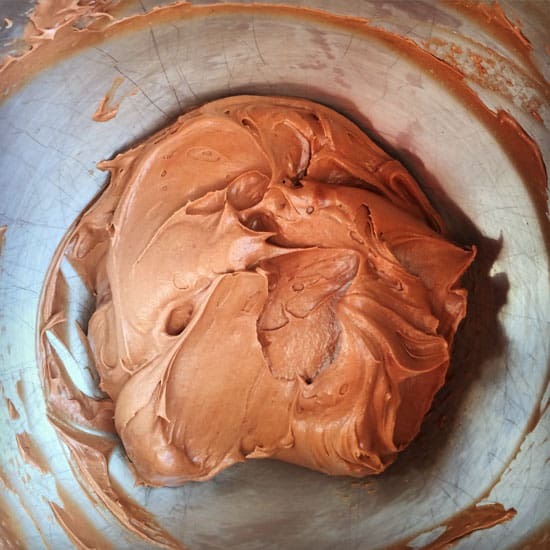 It’s easily my new favorite chocolate frosting recipe. Hands down. The frosting is simple to make, too. While I’m sure this cake will be very good made with pretty much any brand of unsweetened natural cocoa powder, including the Hershey’s that I usually have in the pantry, I used some Scharffen Berger that Phil brought home from work and it really took the cake and frosting to the next level. Although this isn’t a fancy layer cake, it is such a delicious recipe that I think it’s worth splurging on the best quality cocoa powder you can afford, especially if you’re making this for a gift or a special occasion. I had planned on putting chopped walnuts on top of the cake but the last of my walnuts were pretty old and not tasting so great. Luckily I found some pecans in the freezer and they were the perfect addition. 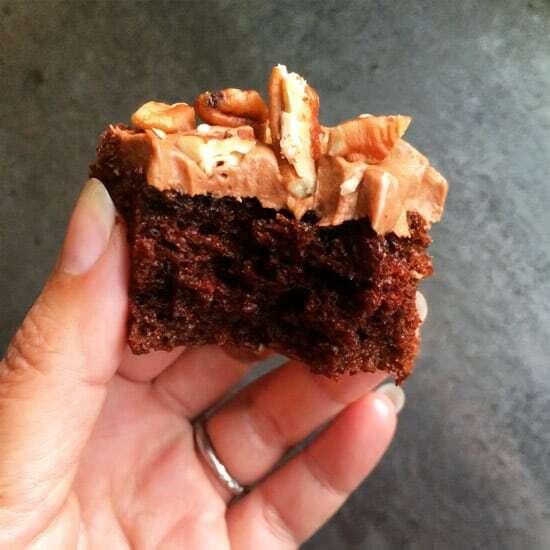 If you don’t like nuts on your chocolate cake, just leave them off. But please, please try the frosting. Preheat oven to 350 degrees. Grease a 13 x 9 inch cake pan with nonstick cooking spray. In a large mixing bowl or the bowl of a stand mixer, combine flour, sugar, cocoa powder, baking soda, and salt, and stir to combine, breaking up any large lumps of cocoa powder. Add all the remaining ingredients to the bowl using a hand mixer or the paddle attachment of a stand mixer, beat on medium speed for 3 minutes, stopping occasionally to scrape down the sides and bottom of bowl with a spatula to make sure all ingredients get incorporated. Pour batter into the greased cake pan (batter will seem thin, but this is okay) and bake on the center rack of preheated oven for 27-30 minutes or until a toothpick inserted in the center of the cake comes out clean and/or the top of center of the cake springs back when touched lightly. It's best to start checking the cake a bit early. Let cake cool completely in the pan on a wire rack. 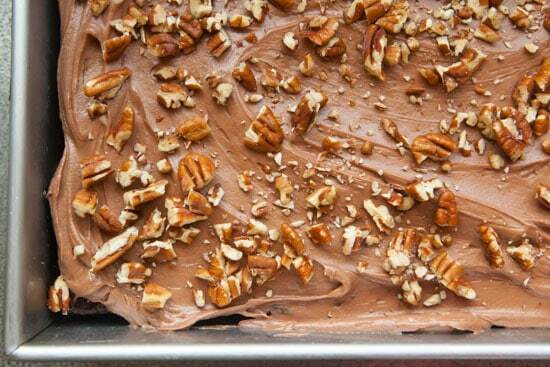 Once completely cool spread the top of the cake with chocolate cream cheese frosting (recipe below) and sprinkle with chopped pecans or walnuts if you like. If using the cream cheese frosting, store leftover cake covered in the refrigerator. If making the cake a day before serving, store the cake covered in the refrigerator but remove it an hour or two before serving as the flavor and texture are best at room temperature (although it's delicious straight out of the fridge as well). I think the cake tastes just as good if not better the next day so it's a great make-ahead cake. Sift powdered sugar and cocoa powder together into a bowl then set aside. Beat cream cheese and butter together with a hand mixer or stand mixer with paddle attachment until light and creamy. On low speed gradually beat in the sugar and cocoa powder, scraping down the sides of the bowl with a spatula as you go. Once it's all incorporated, increase the speed on your mixer to medium and beat for another minute. Use immediately or cover and store in the refrigerator for a day or two. If you decide to make it ahead of time and store it in the refrigerator before frosting a cake, you will need to let the frosting sit out and come to room temperature (then maybe give it another brief mixing to make it creamy and spreadable again) before frosting the cake. So plan ahead. Recipe can be doubled to frost a layer cake or two dozen cupcakes. To make this cake without sourdough starter, simply omit the starter, increase the flour to 2 cups and add 1/2 cup buttermilk or plain yogurt (water or milk could be substituted for the buttermilk or yogurt if that's all you have on hand). I used Diamond Crystal kosher salt when testing this recipe, if using table salt, please decrease the salt amount to 1/2 teaspoon. Plain yogurt (Greek-style or regular) may be substituted for sour cream. Any light-flavored oil can be used in place of canola oil. This recipe has not been tested by me with melted unsalted butter or coconut oil. If you want to try using melted butter in place of the oil, make sure that it is unsalted. *This can be made with starter straight from the fridge as long as it has been regularly fed and isn't too funky. If your starter has been neglected for a while, I would feed it once before using it in this recipe. I keep my starter at 100% hydration, if your starter is very stiff, add a bit of water to make it a batter-like consistency before measuring for this recipe. This recipe was created after reading through several recipes, including the Sourdough Chocolate Cake from King Arthur Flour, and Chocolate Sour Cream Bundt Cake from Two Peas and Their Pod. I made notes, adjusted ingredients according to what I had on hand and what sounded good to me, and came up with this, which will now be my go-to chocolate cake for every occasion that requires a chocolate cake. My husband, who has been saying over and over “I don’t even like chocolate cake!” as he shoves another piece into his mouth, told me that this is a perfect cake. Don’t miss out on any recipes! Sign up to receive Pinch My Salt updates by email. This is my kind of cake! I want to eat it straight from the pan with a fork! I haven't tried a starter since I failed so miserably when we were doing the BBA Challenge, so I should figure it out. The cake would go over quite well around here -- and yes, specifically because of the sourdough. I've never heard of using sourdough starter in a chocolate cake, you def have my interest piqued. The cake looks great! And thanks for the link love! I absolutely hate coffee! So do you have any substitution ideas for it in the cake recipe? But I think I will have to try the frosting on other things that is not homemade. Karen- You can substitute pretty much any liquid for the coffee... water, milk or buttermilk would be fine. Enjoy! 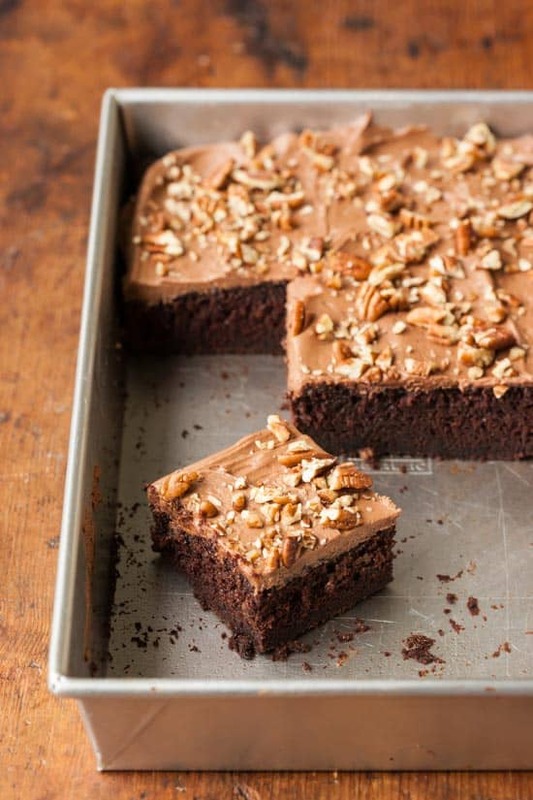 Thanks for sharing the recipe, it looks delicious..
Coffee added to chocolate really brings out the flavor of the chocolate and you don't even taste the coffee when you eat it. I just saw this tip on a British Baking Challenge show. So, I tried it and it's true it really makes anything chocolate pop and no you can't taste the coffee. It sound really easy to prepare. I think that even I can do it. I made this cake yesterday and had high hopes of making the best cake ever. I was disappointed. I didn't use sourdough starter but followed the alternate recipe exactly. The texture was more like a brownie, too dense. Also, the chocolate flavor wasn't as intense as I expected. The recipe doesn't include baking powder. Was it supposed to? I live at almost 9000ft, so to say we have issues with baking is an understatement. Altitude has such an affect on baking because of the fat and leavening contents I have had to adjust all baking recipes. So to this recipe with the starter I added about 3/4 of flour extra and an extra egg and then had to bake an extra 10-15 minutes. That being said, my husband loves it!!! Rich intense flavor and very moist which isn't easy at this altitude! Thanks! I've made this cake twice in a week. The first time it had a rather solid, fudgy consistency a bit like brownies -- good, but not quite what I was expecting. The second time, maybe because the starter was more lively, it was beautiful -- light and airy, but still moist. I'm not generally a huge fan of chocolate cake either, but this is a keeper. It's great even without the frosting ... or, I'd be tempted to try a cream cheese frosting with lemon, lime, or orange in it. Note, mine took much longer to cook than yours -- close to an hour.Is it OK if I put my metric conversion of this recipe on my blog, with a link to yours? Thanks for sharing the recipe, it looks very delicious.. This looks amazing. ive tried sourdough but never like this. I wonder how it would taste as a wheat free version? Patti, Do you use instant coffee? Wowwwwwwwww the pictures of the cake look so great! I'll definitely give this recipe a try! Would butter work as a substitute for the canola oil? I don't have any oil, just butter. Thank you! Adrianne- I think melted butter would work in place of the oil but if the butter is salted, eliminate the salt from the ingredients. I haven't tried this so I can't guarantee the results will be the same. Very great and sumptuous chocolate cakes! Made this cake today. I just obtained a sourdough starter a week ago and have not stopped baking since. Already made two batches of bread, sourdough waffles this morning, and this cake for dessert tonight. It was heavenly. Love the texture. I agree it is a bit dense for a cake, but I don't mind. It's super moist. My favorite part is that it is not too sweet, which is perfect for me. Wanted to let every know what worked for me. I used sea salt, instant decaf coffee, butter instead of canola oil, and replaced the white sugar with 1 cup coconut palm sugar along with 1/2 cup dark brown sugar. Used pecans on top. I also used the convect bake on my oven at 350 and my cake was done at 22 mins. It may have been done at 20 mins but I had set the timer for 22. My husband and I both love it and look forward to sharing it with friends, and trying it out tomorrow, since it states it will be even better after refrigerated. Thanks for the recipe. I just made these in a mini muffin pan. I added a splosh (official measurement) of whole milk because my starter was a bit stiff. O. M. G. I’m not even going to frost them they are so moist and delicious.